Head to Melbourne’s neighbourhoods for a great local experience. For the next three months, there’ll be a family-friendly space in the heart of Point Cook. Fun activities and events will take place in the Stockland Point Cook Town Centre restaurant precinct on Murnong Street. While your friends and family are visiting Melbourne’s west, bring them down to enjoy a wide range of daily activities. Grab a bite at one of the eateries and restaurants lining the streets. Listen to some live music. Bring a picnic rug or beanbag and relax at our pop up cinema, featuring family-friendly movies in the afternoon and movies for grown-ups later on. Fit in a bit of exercise with one of our yoga classes or just relax in the sunshine. 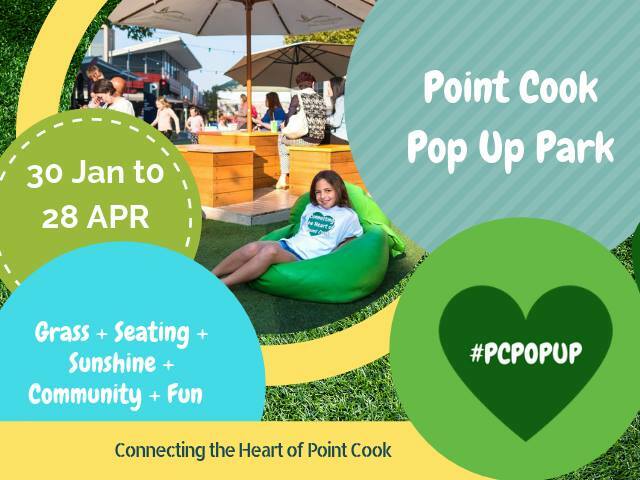 There’s something happening every day at the Point Cook Pop Up Park.